For many home buyers the process of obtaining finance can be a daunting task, particularly as rules around lending changes. So, how can you be prepared and ensure you get the best loan for your property type? In the new book, Property Finance Made Simple, best-selling author and property advisor Andrew Crossley has written a thorough guide to obtaining property finance, empowering readers in any stage of life with the knowledge to make informed decisions. Drawing upon years of industry experience, Crossley covers off topics such as the current lending requirements/considerations, how to get a loan, loan serviceability and borrowing capacity, the various loan-to-value ratios available, types of loans you may be eligible for, and the finance options available for different property types. 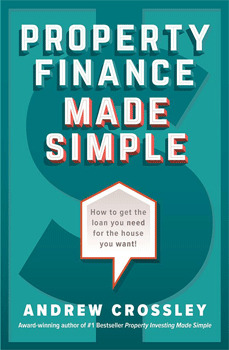 Filled with practical advice and relatable examples, Property Finance Made Simple, provides readers with an accessible guide to obtaining the loan you need for the home you want. Melbourne-based Andrew Crossley is an award-winning property advisor with over two decades of experience. He was a finalist in the Australian Mortgage Awards in 2007/08, 2015 and 2016, and a finalist in the Mortgage Finance Association Awards in 2014, 2015 and 2016. The Australian Property Advisory Group was a finalist in the Australian Small Business Awards of 2016, was highly recommended at the Investor Choice Awards of 2015 and was national runner up in the prestigious Reader's Choice Awards of 2015. Andrew's first book, Property Investing Made Simple, was a best-seller and crowned best real estate book at the 2015 International Book Awards. Question: What are the top three things we need to do when obtaining finance for a new home? Andrew Crossley: 1. The first thing that really helps someone in understanding their capacity is to talk with a mortgage broker to determine which lender will provide the best product for your needs, this includes best rate, policy, and servicing of debt, based on your income, all combined. 2. Make sure you do not change jobs, lenders want stability, so minimum 6 months' permanent part time or full time, and 12 months' casual is preferred. Question: Does this book take into consideration First Home Buyers? Andrew Crossley: Yes, the book was written to assist first home buyers as much, if not more than anyone else. It provides assistance on how to be more successful in obtaining finance and ways to better tackle the affordability crises, as well as tips and suggestions to improve the amount that can be borrowed and the ease in which it can be borrowed. Question: How does Property Finance Made Simple ensure you can get the best loan for your property type? Andrew Crossley: The book goes into detail on different types of property, which property will lead to you not being able to borrow as much as you may need or prefer, and which types of properties are better suited to borrowing up to 95% loan to value ratio. Question: How has finance applications changed, in the last ten years? Andrew Crossley: Applying for finance used to be a very simple process, requiring little to no supporting documentation. Several regulatory and legislative changes have come into being which have dramatically changed the lending landscape. Anti Money Laundering and Counter Terrorism act has led to lenders and mortgage brokers having to be more vigilant with identifying applicants, ensuring they are who they say they are. The greater prevalence of fraud, and more sophisticated methods employed by fraudsters requires that brokers and lenders are very focused on audits and compliance, not just checking the contents of the documents but also the legitimacy of them. Proving income has involved significant change, people that are employees, could previously make up a figure they were earning, just to get a loan, this has ceased. Responsible lending (new regulatory change) requires a greater duty of care when assessing someone for finance. More responsible enquiries as to ones living expenses as opposed merely accepting industry applied benchmarks, such as HEMS or HPI, and also how the assessing of other financial institutions (OFI) debts is undertaken is now leading to a reduced borrowing capacity for every borrower.